Real cycling: Cambridge, cycling paradise? Rubbish! Cambridge may be touted as England's so-called 'real cycling capital'. But in fact its modal share of bike journeys is still low, as this photo proves. 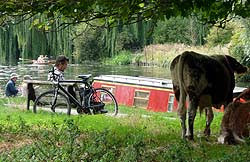 Despite the expensive riverside cycle path, only ONE person-journey is being made by bicycle, compared to TWO on a boat, FOUR in a narrowboat, and two cows occupying valuable space but carrying NO passengers. Anyone trying to convince you that the town is some sort of 'cycling paradise' is clearly deluded. And take this valuable Brompton, left outside the Co-op in Newnham. It's not locked. Obviously the place is so full of thieves, bandits, brigands and cutpurses that locks are useless. Instead, the owner has had to leave it with not one but TWO guard dogs, who viciously wagged their tails and tried to lick us when we approached. Things are so bad there they've had to create a new website, Cycling Sorted, to cope with everyone's suggestions for improvements to the cycling infrastructure. So, cyclists, avoid Cambridge at all costs. I'm grateful to be back in London, I can tell you. Very funny. Good to see that some cycle bloggers can actually include humour in their posts, particularly when it is at the expense of others! All I'm trying to do is entertain people a little. If you enjoy reading the blog half as much as I enjoy writing it, but I only enjoy writing it two-thirds as much as I enjoy actually cycling, and cycling in Cambridge is five-eighths more enjoyable than cycling in London, then prove that the real part of any non-trivial zero of the Riemann zeta function is 1/2. The Brompton owner won't be laughing after the dogs have pissed all over it. As, in my experience, dogs adjacent to parked bicycles tend to. Well, these dogs at least seemed well-trained. As was the collie we encountered on the riverside path shortly after, which had been trained to lie down whenever it saw a bike. It's a wonder it ever gets any exercise in Cambridge. What a god-forsaken place. Truly horrible. Just awful. Such a waste. Don't go to Holland - I hear it''s even worse! I just read in chapter 19 of The World's Favourite Cycling Book that Cambridge is "England's number 1 cycle-friendly city". So you can quote that published fact if anybody ever disputes it. 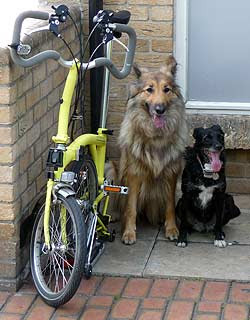 or to www.cyclestreets.net - I'd love to have that dog photo too! @String Bean Jen, Tim... I lost access to my Flickr account for a while for various reasons, but have it back now. I've linked the doggy photo to a larger version there.